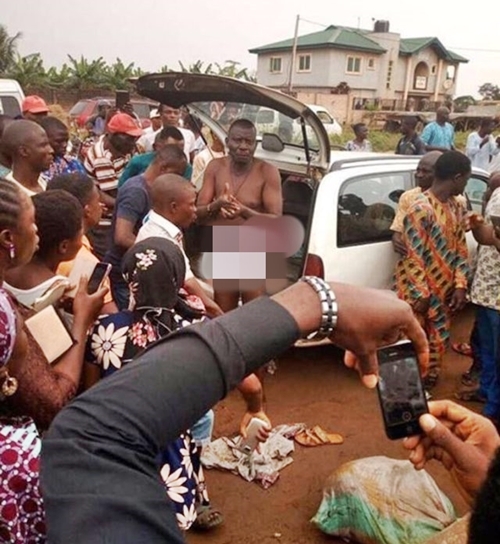 There was mild drama yesterday in Mowe, Ogun State, after a man was allegedly caught with seven human heads on his way to Lagos state. The Mowe area of Ogun state was agog on Thursday afternoon after a man was caught in possession of seven human heads. It was gathered that the suspected ritualist, had been on his way to Lagos and had contacted a commercial bus driver for transportation. When he insisted on being the only passenger in the 18-seater bus, the bus driver was suspicious and asked to see the content of the sack in his possessions, although he insisted they were just clothes. However, luck ran out on him when he was discovered with the severed human heads and was promptly apprehended.